Colombia is famous for its coffee, chocolate, and dense tropical rain-forests. Like many countries around the world, Colombia has had its ups and downs but in the last decade has become an economic powerhouse in Latin America. This has made it an attractive destination for foreign businesses, investments, and personal endeavors. It is no surprise then that many Canadian businesses and individuals have turned their focus to Colombia in recent years. These exchanges between the two countries require paperwork, namely Canadian personal documents such as birth certificates, marriage certificates, death certificates, degrees and transcripts, and corporate documents such as Certificate of Incorporation, Articles of Incorporation, CPP and GMP for use in Colombia and vice versa. Both Colombia and Canada have their own processes for validating documents issued in foreign countries. In short, they have a method of verifying if a foreign document is legitimate and real. This process is known as an apostille in Colombia and it is one of the most widely used methods of verifying documents that were issued in foreign countries. However, Canada has not signed the Hague apostille convention and does not have an apostille process. Instead, Canada uses the original two step process of authentication and legalization. The first step of authentication takes place at Global Affairs Canada here in Ottawa, and legalization takes place at the consulate of the embassy of Colombia. Once this has been done in Canada, your Canadian documents may then require additional legalization, sometimes referred to as “superlegalization” at the Ministerio de Relaciones Exteriores (Ministry of Exterior Relations) in Bogota, Colombia. 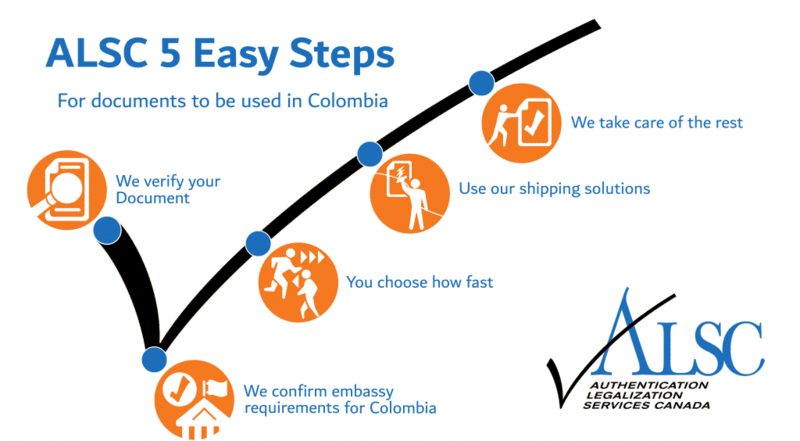 Regardless of what kind of documents you have or what you are using them for, if you want to use your Canadian documents in Colombia you will have to go through the Canadian two step process. On paper, it seems simple enough: authentication at Global Affairs Canada and legalization at the embassy consulate of Colombia. However, in reality authentication and legalization is one of the most stressful processes involved in international affairs. This is because authentication at Global Affairs Canada can take up to 20 business days and legalization at the embassy of Colombia can only be done once you have met their requirements and fees, which change almost every month. For many Canadians rushing to meet their deadlines in Colombia, the amount of potential delay which can occur is simply not an option. Thankfully, there is an easy solution. Over 25 years ago, we helped our first client make their documents global. Since then, we have remained the leaders in our industry and have become experts on every Canadian document for use in Colombia and elsewhere around the world. From law firms and pharmaceutical companies to famous musicians, actors, and former Canadian prime ministers, we have helped thousands of Canadian businesses and individuals with their Canadian documents. The strong relationships we have built with Global Affairs Canada and the consular staff at the embassy of Colombia allows us to extend those same benefits to our clients. We are always up to date on their changing requirements and fees. We can have your documents authenticated as soon as the same day they arrive in our office on our priority service. We also offer an affordable 3 business day authentication service as well as a 10 business day authentication service if you are processing multiple documents on a budget. At the embassy we make sure your documents have been legalized properly. 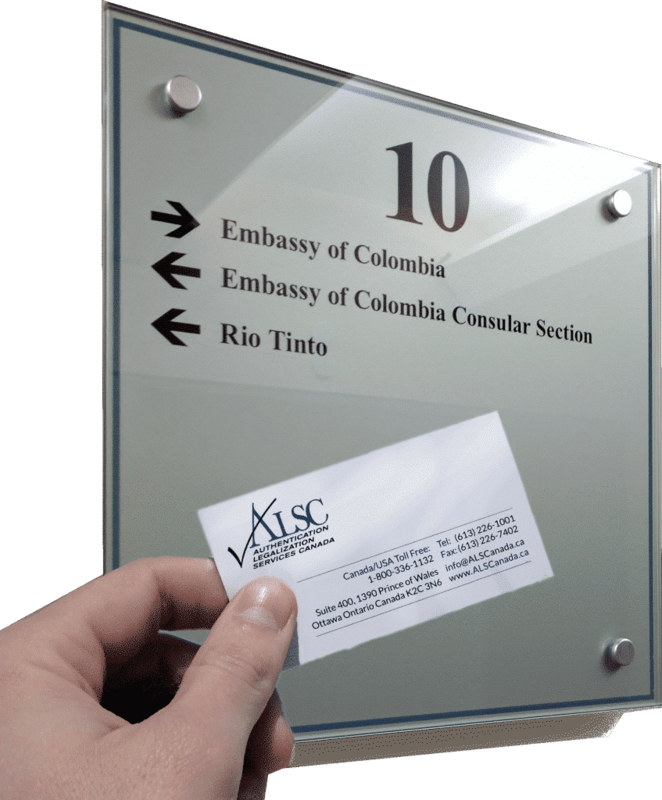 In fact, that’s our service guarantee: we promise that your Canadian documents will be valid for use in Colombia. Please note that we cannot assist you with the super-legalization process that needs to take place at their Ministerio de Relaciones Exteriores once your documents have been processed in Canada. We do guarantee however that they will be accepted there. When you use our services, you receive detailed updates every step of the way and have your own personal agent to help you prepare your documents and answer any questions or address any concerns you may have throughout the process. If you are in a rush, we will do everything we can to help you meet your deadline. Once your documents have been completed we can send them anywhere in the world they need to go through one of our shipping partners. Contact us now for fast and stress free authentication and legalization of your Canadian documents for use in Colombia. Continue reading for more information on Canadian documents commonly used in Colombia and how we can help you. As Canadian companies rush to put new products on Colombian shelves, partner with rapidly expanding Colombian companies, or expand existing subsidiaries in Colombia, there are numerous corporate documents that are required by authorities in Colombia. The exact documents required depends entirely on the demands of the requesting party in Colombia and the additional processes that will be required once they have been accepted in Colombia, such as the superlegalization that will need to take place in Bogota, Colombia at the Ministerio de Relaciones Exteriores. These corporate documents include but are certainly not limited to International Trade Certificates, Good Manufacturing Practice Certificate, Certificate of Pharmaceutical Product, Manufacturer’s Certificates, and Certificates/Articles of Incorporation. As an existing corporation, it is likely you have most of these documents on hand. If you do not, many of these documents are issued by Industry Canada and other provincial entities. Some documents such as Articles of Amendment, Certificate of Incorporation, and Articles of Amalgamation require forms to be completed before they can be issued. These forms can be found by clicking here. Like many other Canadian documents, Canadian corporate documents require notarization by a lawyer or notary public. Documents such as Corporate Powers of Attorney and Agreements can be drafted for you by lawyers at an additional cost. Alternatively, there are many useful templates which can be found online if you choose to draft your own and then have a lawyer or notary public notarize your document. Another option which many of our clients take advantage of is using the Canadian Chamber of Commerce here in Ottawa. Their “TradeCert – Certification Made Simple” service can certify your Canadian Certificates of Origin and Commercial Invoice for use in Colombia. The signatures at the Canadian Chamber of Commerce are recognized by Global Affairs Canada which makes them valid for authentication and subsequent legalization at the embassy consulate of Colombia. As proud members of the Canadian Chamber of Commerce, we can pick up your documents free of charge once they have been signed by the Chamber. We can even begin processing the documents you have completed through TradeCert if you send them to us via email. Please contact our office if you are interested in this option. There are some instances where using the original Canadian corporate document in Colombia cannot or should not be done. In fact, many of our corporate clients choose to make notarized copies of their documents when the originals are difficult or impossible to have reissued and cannot afford to be damaged or lost. It is important to note that although we guarantee proper authentication and legalization for use in Colombia, we do not guarantee that your documents will be accepted by the requesting party in Colombia. We strongly advise that you always clarify exactly which Canadian corporate documents you require for use in Colombia and if originals are needed or notarized copies will suffice. Some of our clients come scrambling back to us after realizing they were missing documents or provided the wrong ones, sometimes just days away from their deadline. This often ends up costing them lots of money and unnecessary stress. Make sure you communicate with your affiliates in Colombia before beginning the process! Canadian vital statistics documents such as birth certificates, marriage certificates, and death certificates are commonly requested documents for personal affairs in Colombia. These include matters related to citizenship, immigration, marriage or divorce, or to claim an inheritance in Colombia. Canadian vital statistics documents are arguably the most important documents that can be issued to you in your lifetime. However, they are rarely required for use within Canada and are often lost or damaged over time as a result. Thankfully, its quite easy to get a new Canadian birth certificate, marriage certificate, or death certificate for use in Colombia. Before you order your Canadian vital statistics document from the province which issued it, keep in mind that only certain types of vital statistics documents are valid for authentication by Global Affairs Canada. As a rule of thumb, you always want to order the long form versions of your vital statistics documents. Short form versions or wallet sized Birth Certificates cannot be authenticated by Global Affairs Canada and are occasionally not even accepted in foreign countries even if you make a notarized copy of the document. It is always best to use original, long form Canadian vital statistics documents (if available) for authentication and legalization. The signatures on those documents are recognized by Global Affairs Canada which means they do not require notarization. In fact, it is often less expensive to order a new document than to have your original notarized. If you do decide you want to have a notarized copy of your Canadian birth certificate, marriage certificate, or death certificate, processed we can do this for you when you use our services. Keep in mind that, as with corporate documents, notarized copies may not always be accepted so make sure to check with the requesting party in Colombia. Please note that these documents will also require legalization at the Ministry of Exterior Relations in Bogota, Colombia, once they have been through the Canadian two step process. If you require a new Canadian birth certificate, marriage certificate, or death certificate, you can order one using the links below. If you need to do this, we strongly recommend you have your documents shipped directly to our office when you order them. This can save you processing time especially if you are currently living in Colombia. It is likely that we can have your Canadian document authenticated and legalized for use in Colombia in the time it would take for it to arrive to you unprocessed by regular mail. Many of our clients choose to have their vital statistics documents shipped to our head office when they order them, and they are all happy that they did! Authentication and legalization can be very stressful and confusing. With all the details involved, its almost impossible to get it done right on the first try even if you’ve done it before. That’s why we exist; we always get it right. It took us years of hard work to learn all of the details of this process. Over two decades later, our proud membership with the Canadian Chamber of Commerce, our A+ rating with the BBB, and our countless 5-star Facebook and Google reviews are proof that our hard work has paid off. We are the best in our industry and provide a level of professional service that is seldom seen even in other industries. We are also the most accessible service provider in our industry, with over a dozen service centers in most major cities across Canada. If you live in or near Victoria, Vancouver, Surrey, Calgary, Edmonton, Regina, Winnipeg, Toronto, North York, Mississauga, Halifax, or Montreal, our service centers are a convenient alternative to the post office. Once you have made an appointment with our head office, you can drop off your documents and receive free priority shipping to our head office in Ottawa for processing. Upon completion, we can ship your documents back to our service center for pickup, also free of charge, or send them elsewhere in the world they may need to go at an additional cost. Take note of the address below as you will have to have your Canadian documents legalized in Colombia at their Ministry of Exterior Relations. Save yourself time and money in the long run that can be better spent with family and friends or on your next business project. Whatever your purposes are, our experts here are here to help you with your Canadian documents for use in Colombia. Click below to get started with ALSC!